Balancing Act. Why do Tightrope Walkers carry a pole or bar? It all has to do with inertia and resistance to the object that is rotating it. A simple rotation of the pole allows the walker to re-center directly over the tightrope. 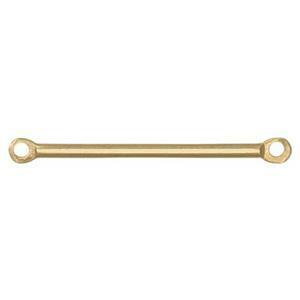 The GF3340 – a Yellow Gold Filled Tiny Bar Link. A little bit of a bar to help you balance out a hanging dangle from an earring – or a link to a necklace. Giving you the needed edge for those breath catching performances your jewelry designs make. very simple and small, a perfect little touch of gold in my designs. My customers love it, i need a silver one just like this now!